LOUDON, N.H — If practice fast can turn into Sunday fast, Kyle Larson could be on your short list of who wins the Bad Boy Off Road 300 at New Hampshire Motor Speedway. 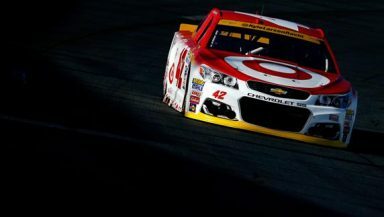 The driver of the Target Chip Ganassi Racing with Felix Sabates Chevrolet paced the first Saturday practice with a speed of 132.186 mph and finished off Happy Hour with a speed of 132.577 mph. Larson’s 10-lap average in final practice was third fastest at 131.342 mph just behind Joe Gibbs Racing pole sitter Carl Edwards and Stewart-Haas Racing’s Kevin Harvick. Other Chase drivers on single lap speed in final practice. Jimmie Johnson spent the first 10 minutes of the first practice practicing getting in and out of the pits following a speeding penalty last week at Chicago. In final practice, the Hendrick Motorsports cars looked solid with all four Hendrick drivers, Johnson (fifth), Elliott (seventh), Kahne (eighth) and Alex Bowman (10th) on the list of 10-lap averages. Johnson looked especially fast as he was one of the few Chevrolets who actually passed a Toyota in practice when Johnson passed Kyle Busch on the frontstretch.